This instrument is neither signed nor dated, but the use of Gothic script and numerals as well as some words of obvious Italian origin suggest that it was made in an Italian environment in the late 15th century. The markings are carried out in a rather crude manner and the rete and one of the plates seem unfinished. The plates are laid out for the climates, the seven inhabitable regions of the earth according to Ptolemy. The alidade can be used as a sundial for unequal hours with one of the sighting vanes acting as a gnomon. 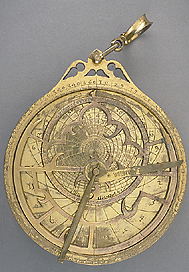 This feature can be found on some Islamic instruments, but is not very common for European astrolabes.